RMS Laconia, photographed in 1912 as a Cunard ship. Sidney Philcox is one of the men named on the Bottesford ‘church list’ of WW1 Servicemen. Dates of the births of members of the Philcox family are slightly inconsistent in the various records examined, and those given here may be in error to a small extent. Even so, they set out a coherent family history. Sidney Philcox was born on the 23rd October, 1893, at Bottesford, the son of Kate Philcox, whose parents were John Philcox, who was born in 1830 at Battle, Sussex, and Sarah Philcox (nee Robinson), born in 1831 at Bottesford. John and Sarah were married on the 23rd April 1855 at Bottseford. By 1871, they were living on Albert Street with six children, Mary (aged 13), John (9), Sarah Elizabeth (7), Fanny (5) and twins Annie and Kate who were born on the 18th February 1871 and baptised two days later. Annie sadly died very soon after. Kate Philcox went on the marry Alfred Cragg Singleton in 1896, and they had two daughters, Elsie (b.1898) and Gladys (b.1899). However, her son Sidney was born in 1893. Moreover, when he was living with the Singletons in 1911 he was described as a stepson. This implies that Alfred Singleton was not his father, whose identity has not been discovered. In 1901, eight years old Sidney was living with his elderly grand-parents, John and Sarah, at 8 Chapel Street, together with his 17 year old cousin Minnie Hands. His mother Kate Singleton and her husband and daughters lived round the corner at 20 Queen Street. Sarah Philcox died in 1904 aged 73, and John in November 1910, aged 80. In 1911, Sidney, now an 18 year old ‘assistant butcher’, was the stepson in the family of Alfred and Kate Singleton and their daughters, who by now lived in Normanton, just north of Bottesford. Sidney Philcox served in the Royal Marines Light Infantry during WW1. He was Private 18121, Chatham Division. When he enlisted on the 9th August 1913, aged 19, he declared that he had been born in Bottesford on the 23rd October 1893, was a butcher’s assistant and that his next of kin was his mother, Kate Singleton, of Normanton, Bottesford. 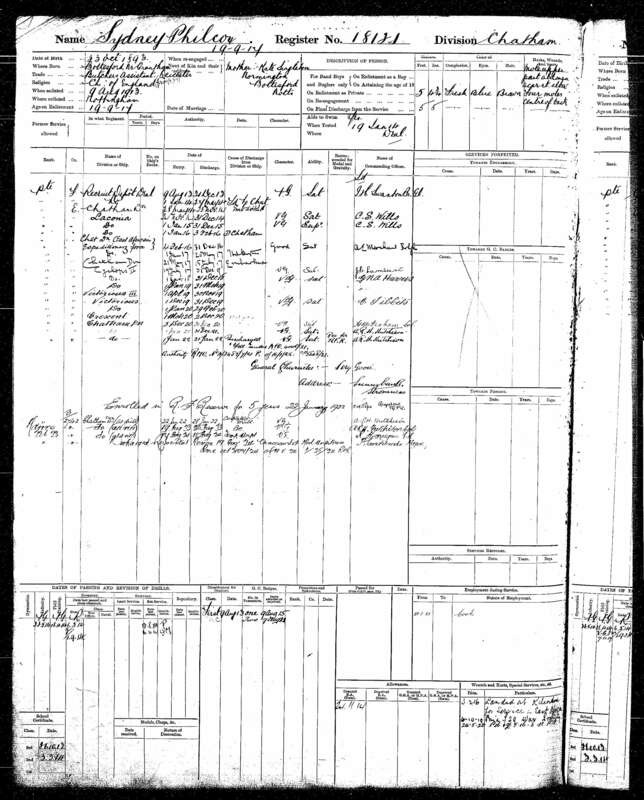 His service record sheet indicates that after being at Chatham until the 23rd November 1914 he embarked on the Laconia, where he remained until the 3rd February 1916. She had been built as a passenger liner, launched in 1911 and owned by the Cunard Line. 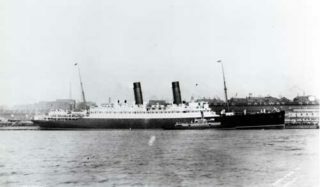 On the outbreak of war she had been converted into an armed merchant cruiser and based at Simon’s Town, South Africa. She patrolled in the Indian Ocean and became the HQ ship for operations to capture Tanga and the colony of German East Africa. She was returned to Cunard in July 1916, but tragically was torpedoed and sunk on the 25th February 1917 off Ireland. After leaving the Laconia, Sidney Philcox served on HMS Cyclops, a submarine depot and repair ship, and then on HMS Victorious, a pre-dreadnought battleship used as a repair ship. He was discharged on the 22nd January 1922, giving his address as Sunnybank, Stromness. He enrolled for a further five years in the Reserve. Though never promoted, his character was described as “Very Good”. He was awarded the 1914-15 Star, the Victory Medal and British War Medal. We have found almost nothing from the online records about Sidney Philcox’s life after leaving the navy. 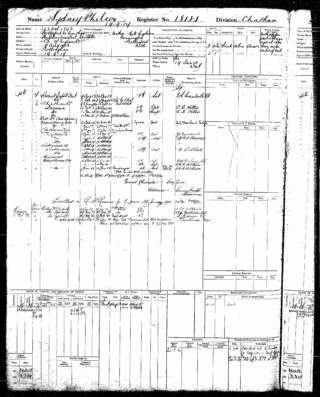 No records of him have been found in Electoral Rolls or in the 1939 register, and his death record has not been found, but has become clear that following the war he lived most, if not all, of the remainder of his life in Orkney. There is a record of a man named Sidney Philcox who married Irene M Berry in 1928 at Bromley, Kent, but this seems unlikely to have been the man from Bottesford. Mr Sid Cameron, Sidney Philcox’s grandson, has kindly informed us (see the following Comment) that Sidney Philcox’s had two wives. His first wife died “very young, suffering from gum disease”. Sid Cameron’s mother, named Violet, must have been Sid Philcox’s daughter from his second marriage. The family lived in Stromness, Orkney, and Sid died around 1961 suffering from lung cancer. Details of his post-war life and of his death have not been found. This Sidney Philcox was my grandfather. I have two of his Great War medals but not the 1914-15 Star. My mother was Violet Philcox who married George Cameron and lived in Thurso, Caithness, all her life from the age of 16. I believe, that is when she got married. I remember as a child visiting Orkney many times and meeting Sidney, who worked in an Ironmonger in Stromness. His first wife, my grandmother, died very young suffering from gum disease. Sidney remarried and lived out his life in a cottage in North End Road, Stromness. He died of Lung cancer I believe sometime around 1961. His Son Jimmy emigrated to Canada and built up a carpentry business there, I believe. Both Jimmy and my mother have now passed away.